Marvin-McMurray Methodist Episcopal Church, South, began in 1889 as a prayer meeting and Sunday School for children of friends and neighbors in the home of Mrs. Hannah Culp, who saw the need for religious services in the north end of St. Joseph. Rev. D. F. Bone conducted the services. Attendance grew, necessitating a permanent church home. In 1891, a lot was purchased on the corner of Spruce (now 9th Street) & Madison, on which a small frame church and four room parsonage was constructed. 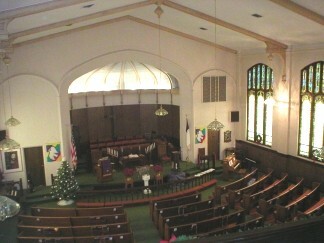 The church was named “Spruce Street Methodist Episcopal Church, South”. This building was expanded by several additions until it was totally outgrown. The congregation sought a more central location on St. Joseph Avenue, and eventually purchased lots on the corner of Randolph Street, on which the present building was completed in 1925. The name was changed to honor Bishop Enoch Marvin, a pioneer preacher who later became a bishop and Bishop William Fletcher McMurry, who was the presiding bishop at that time. Updated February 18, 2010 . © 2000 Allied Arts Council of St. Joseph, Inc. Special thanks to CCP Online for hosting this site. Funding for this site has been provided by the Missouri Arts Council. Traffic to this site monitored by Hitbox.